I really like your call sign plaque sitting on top of the Ameritron amplifier. Where would one go to get one of those? Now I did try to get onto their site this morning and it was down, so they may be having server problems. Great guys to deal with, they are hams. I recently added a TS-850S to the HF radio lineup. So I moved equipment around and this is what my operating desk looks like. 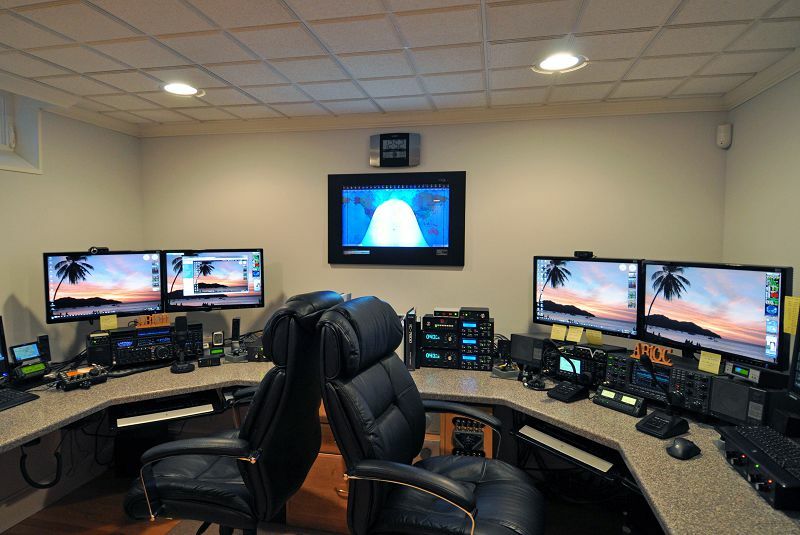 If you visit my website and scroll down you can view my shack. My XYL Anita (AB1QB) and I recently completed a new multi-op shack, tower and associated 160 m - 70 cm antenna system. The station has two SO2R positions. 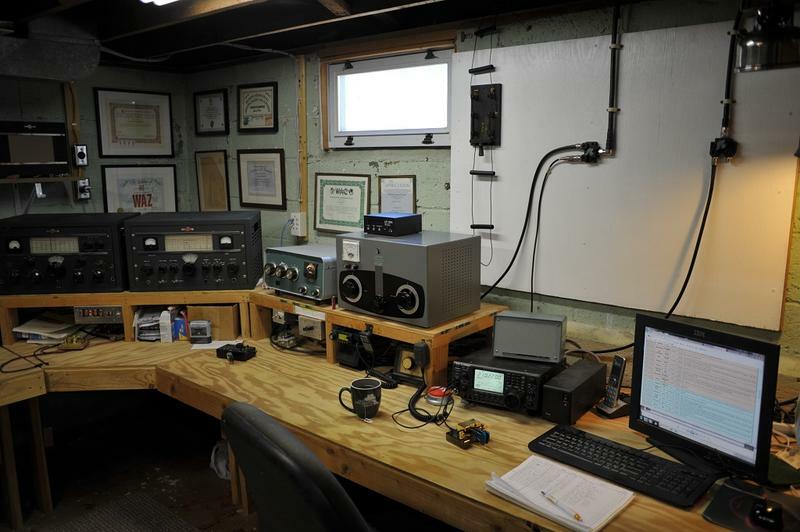 The shack was purpose-built for Amateur Radio. See our Blog at http://stationproject.wordpress.com for pictures, video and details. Thanks Rick! The site is back up and I just put one on order. I have been meaning to do this forever. I saw yours and said to myself, "I have to get me one of those now"!! Only 1 suggestion. Get rid of those chairs and replace with hardwood ones. I just about fell asleep looking at them, can imagine what would happen if I sat in them. Everything is at a comfortable level / height to operate. I placed the most used equiment closer together with lesser used stuff located further away. 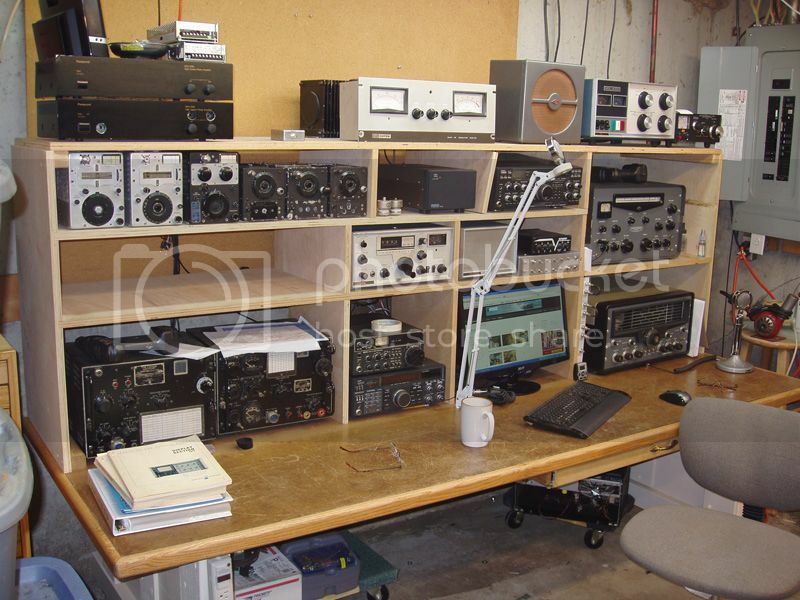 The desk is plenty deep for radio equipment and comfortable CW operating. Everything was built to hold a full compliment of boatanchors (used to have heaver stuff up there than shown). Not shown but directly to the right is a work bench with shelving I built that is deep enough to hold test gear and the bench surface deep enough to accomodate a boatanchor if needed.. also same height as desk. Years of apartment living I kept thinking of exactly how I wanted my station when I bought a house and this is the result. Not nearly as nice as many here, however, I really enjoy A.M.. Although I have several more receivers and transmitters than shown here, this is my current station. Not nearly as nice as many here, however, I really enjoy A.M..